Once you select a package you are directed to the secure payment processing page. Upon completion of payment a short 50 second video will instruct you on what information is required in the form. We gather the necessary information needed and construct a tweet, Featured Campaign, Facebook post, Press release and submission to Google search engine for you. The tweet and Facebook posts includes your description/title, campaign link, main campaign image, and your Twitter handle. We then tweet your campaign to our large followers base of donors, fundraiser’s, and angels (anonymous donors). We currently boast a large followers base of over 3,575,250 dedicated & active followers. Every tweet that we do for you has your Twitter handle included and you will receive an update in your Twitter “Notifications”. Orders are received 24 hours a day, 365 days a year! All orders that are received between 8:01pm PST and 4:49pm PST are processed and scheduled between 5:00pm PST and 8:00pm PST. All orders received (COMPLETED with correct info) are scheduled. If an order is placed at 8:01pm PST it will be scheduled the following day at 5:00pm PST. Please ensure your that after your payment is processed your form is complete or your order will be delayed/held pending manual override in the system. Please search the Facebook groups, Facebook and Twitter for your @twitterhandle or your Bit.lylink and this will result in your messages being displayed. A partial list of the groups is below. We tweet your campaign 4-8 times daily and from several different and large Twitter pages that we manage. This guarantees that your page receives incredible exposure and helps your fundraising campaign go viral. Over 2,960,000 Followers with more added daily. No! We also promote and have had great success with all Crowd Funding platforms such as IDIDIT, KickStarter, IndieGoGo, DonorsChoose, Razoo, Fundly, FundRazr, and many more! If you have a specific Campaign provider you want to confirm simply create a Support ticket and we will answer it promptly for you. Our state of the art scheduling system ensures EVERY tweet and Facebook post is delivered at a specific date and time so you KNOW it is getting delivered! We will begin promoting your campaign page as describe above within 24 hours of receipt of your completed form in the case of holidays. Usually we will start immediately or within 6 hours max provided that your form is COMPLETE and not missing information. When we disseminate and distribute a press release to over 80,000+ Editors and 400+ News sites that dramatically increases the exposure of your campaign. How many times have you seen a campaign on your local news or even on National news like CNN, Fox etc.? 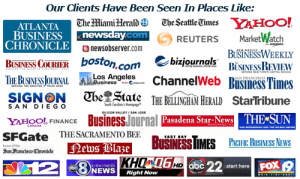 When we distribute a press release for you editors of these MAJOR media publications may like your campaign and place it in their local newspaper, tv station or website. Imagine how many people could be exposed to your campaign? “When you send my Campaign to over 3,575,250 Twitter and Facebook what is it going to look like? Here is a sample image with details of what is included. Feel free to suggest and specific #Hashtags or keywords or let our experts do it for you!